"Waiting in the wings of the forthcoming global turmoil is the Man with a Plan--the one whom the world will welcome to resolve its many problems. " In the fifth century the royal line of the Franks intermarried with the Merovingian dynasty, which ultimately links with the family trees of the Habsburgs, the House of Lorraine, Plantard, Luxembourg, Pontzat, Montesquieu, Sinclair, Stuarts, and most of the royal families of Europe. Among contemporary luminaries are Otto von Habsburg of Austria11 and his son, Karl, and King Juan Carlos I of Spain and his son, Felipe. There are a number of occultic groups that hold to the outrageous suggestion that the Merovingian line is directly linked to offspring from Jesus and Mary Magdalene.12 While obviously a blasphemous lie, it is interesting that there are people who take this seriously. Could this Satanic delusion have an end-time purpose? He will be the master of deceit (even more than the politicians who presently dominate the District of Corruption!). Jesus warned us that if it were possible he would deceive the very elect.13 Our protection must be spiritual, not just intellectual. It certainly is an exciting time to find out what the Bible really says about the times in which we live! Scripture tells us not to be ignorant of Satan's devices,15 so for more see our Briefing Package, The Coming World Leader. 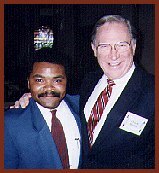 Missler, Chuck, The Coming World Leader Briefing Package, Koinonia House, 1995. Taylor, Charles R., The Antichrist King--Juan Carlos?, Bible Prophecy for Today, Huntington Beach, CA, 1994. His physical description is given in Zechariah 11:17. For more background, see our Briefing Package, The Coming World Leader, on page 27. For background on Otto von Habsburg, in his present role as a member of the European Parliament, and his comments over lunch last year, see our Iron Mixed With Clay Briefing Package. The Prieur de Sion is among the elusive secret societies that traces its interests from the Knights Templar and is believed to have global government ambitions. This article was first published in the September 1995 edition of Personal Update.